With heavy eyes and very full suitcases we started off for Bristol airport in the early hours. After pretty much a full day of travelling, sleeping, and planning we finally arrived in Kampala, with our PATH associates. We travelled to the hotel and settled down for (what was left of) the night. The next day consisted of getting some local Ugandan shillings, going to a local market and purchasing some local clothes and gifts and a lengthy working lunch/planning session in the hotel lobby, addressing the agenda for the week to come. With such a jam packed agenda, working out the details was of importance, as we had a lot to fit in and only a certain amount of time to achieve it. Officially day 1 came around and we were all off to a local hotel called the Mt Zion Hotel in central Kampala to meet all of the study team. This consisted of 8 AI technicians, 2 coordinators, Heifer employees, drivers, local distributors and of course PATH and RRL. The day consisted of an introduction into the study, and giving a general idea as to each person’s role within the study. The Idea of the study is to test the two products; P4Rapid and P4Gold in the field and in the lab, comparing results to the gold standard, RRL ELISA. Milks used in the field are being transported back to the lab where they are tested a second time. We troubleshot any problems that had already cropped up (such as keeping milk cold in the hot Ugandan climate) and got to know one another. Day 2 consisted of a split task force; in the morning PATH and Maggie went back to the Mt Zion Hotel to undertake a usability assessment with the AI techs, using just P4Rapid. At the same time, another PATH member and Georgia went to the CoVAB Laboratory at the University of Makerere to train the staff on how to perform a RRL ELISA Plate (considered the gold standard and used in the study to compare results of Lateral Flow Devices). 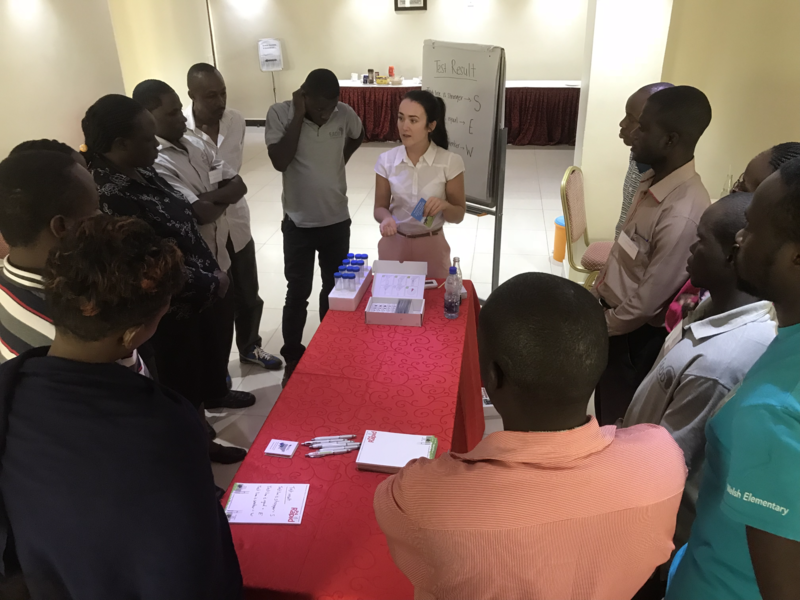 In the afternoon the whole team convened at the Mt Zion Hotel and Georgia trained all AI techs and Laboratory techs together on both P4Rapid and P4Gold. The tests were demonstrated, and the technicians then practised themselves with mentoring. On Day 3 the whole team travelled to the outskirts of Kampala to Kitale Mixed Farm where a demonstration to local farmers occurred followed by a Q&A with Maggie. After this, AI techs took milk samples from some cows on site and used this milk to both practice again but also demonstrate to the other farmers and distributors attending. The afternoon consisted of some more training on ELISA in the lab, whilst the AI techs were sent back to their homes with P4R and P4G in hand, ready to start sample collection the following day. RRL made their way home that evening but PATH remained in the field for Days 4 & 5 to observe study start and troubleshoot. The study has now commenced and continue for 2 months with data continuously being uploaded onto a server and analysed.